Kajodi Devi was born into a middle-level farming household and was encouraged by her progressive parents to go to school. Her mother even unburdened Kajodi of household chores so she could concentrate on her studies. However, in accordance with the prevailing social customs in those days, she got married at the age of 11. When Kajodi got married she was told to stop her studies by her in-laws. Her husband’s family owned about 5 bigha (1.25 ha) of dry land and two buffaloes. Her husband developed TB and became unfit to work, so Kajodi had to help in the farm, work in other people’s houses and ultimately was forced to sell off 2 bhiga land for his treatment. When a Self Help Group (SHG) was formed in her village in 2005, she was selected as the chair and put in charge of all bank-related transactions, since she was the only literate woman. Kajodi was very happy with this work. She managed to buy a buffalo and by selling some of the milk produced, she was able to earn Rs. 2,000 incremental income per month. SRIJAN, one of Women on Wings’ business partners, works in various areas on improving livelihoods in rural India, one being a dairy program called Maitree. 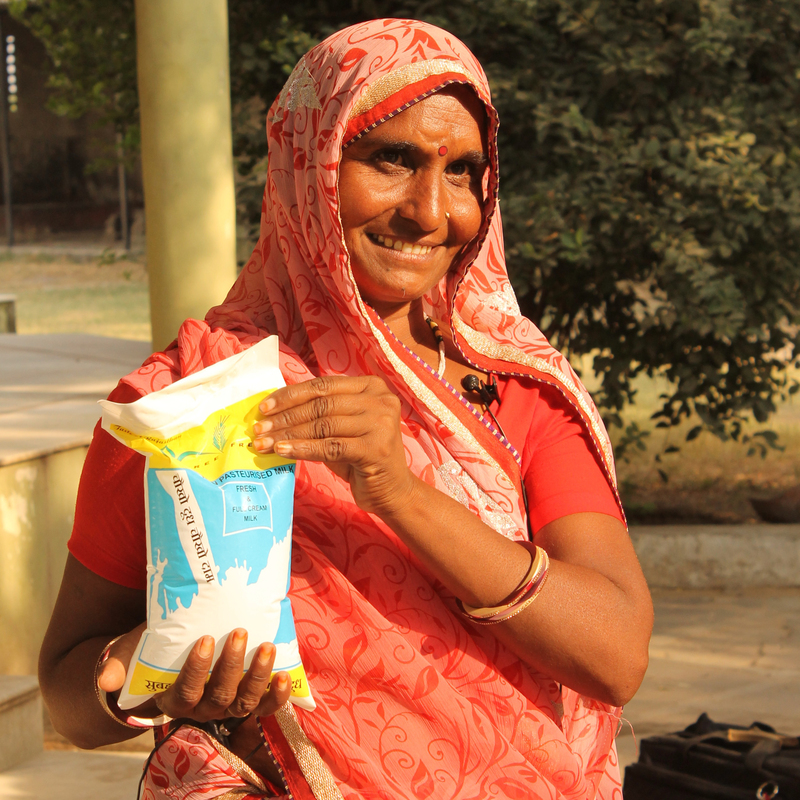 When the Maitree Federation started milk collection in Kajodi’s village, she was given the job of maintaining the records of the SHG and started receiving remuneration for her work in 2007. Gradually, her responsibilities grew. She assisted six SHG’s in three neighbouring villages, was actively involved in the promotion of 12 new SHG’s and became secretary of the Maitree Federation. After strengthening her economical position, Kajodi started investing in the education of her two sons and one daughter. She insisted on having her daughter complete her schooling, in spite of strong resistance from her in-laws. Kajodi then took a loan from the SHG and used it to buy a sewing machine. She encouraged her daughter to do some stitching after school hours to finance her education herself. Her daughter is now studying nursing. Kajodi got noticed in her society for her work and economic development and her husband started supporting her. She joins in participating in programs promoted by SRIJAN and as a fiercely devoted member of the Maitree Federation, she is very positive about taking it to new heights. Kajodi’s future plans include opening a shop selling animal feed and vet care materials at her door step, educating her children to the highest possible levels and building a new house. Women on Wings has co-created 207,500 jobs for women in rural India in over nine years. This number of jobs is the result of partnerships with 29 business partners, like SRIJAN, from around India. Women on Wings experts share their time and knowledge pro bono with these social enterprises to support them in expanding their businesses so they sell more products and thus create more employment for women. Because investing in a woman is investing in a whole family.